In the deep south of Louisiana, the idea of creating a uniquely authentic Cajun seasoning with a perfect balance of spices was born. 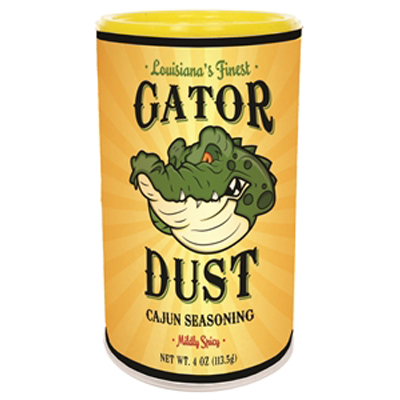 We call it Gator Dust!- and it's a true ""Cajun Country"" seasoning that makes deep fried alligator and frog legs come alive! Our spice adds robust Cajun flavors to all of your favorite foods (and it gets spicier the more you add) without the extra salt and additives found in most traditional seasonings, We believe great Cajun food is South Louisiana country cooking that's not spicy hot, but uniquely flavorful! Delicious on Fish, Chicken, Red Beans and Rice, Jambalaya, French Fries, and even Popcorn! Directions: Sprinkle generously on your favorite foods before, during or after cooking.